This was a fun card to make. 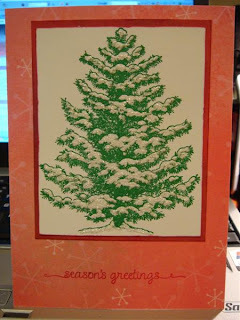 I used the branch from the Bird Sanctuary set (M4746) by Stampington - stamped it in Eden Green Stazon ink. 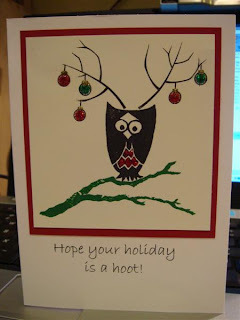 The owl is from Impress (www.impressrubberstamps.com). Added the atlers and ornaments from the Deer to My Heart set (CL114) from Memorey Box (www.memoryboxco.com). Love, love, love their stamps. The message at the bottom I did on my computer. This card was made using just 1 image - 96847-P by Inkadinkado. Stamped in Eden Green Stazon ink. Added Frosted Lace stickles where the snow would be. Layered it on red paper and then red paper with snowflakes on it. The "seasons greetings" message is from Hero Arts. 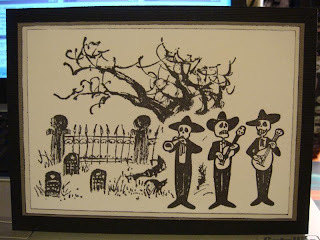 Day of the Dead or Dia de los Muertos is a very cool holiday. It is a 3 day Mexican holiday in which people honor those loved ones who have passed on. 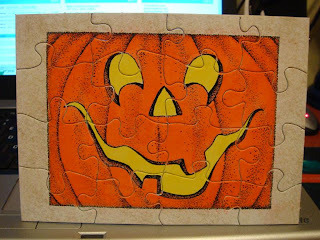 The card below consists of Ghostly Night 3218K by Penny Black (www.pennyblackinc.com) and 4 images from Viva Las Vegas. I used only black ink on white paper and layered. 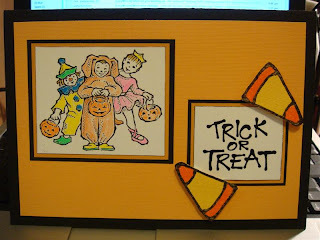 Below are some Halloween cards I made today. Although they are basically the same as the puzzles, these have been layered on cardstock and there is a pocket inside that the puzzle will sit in. 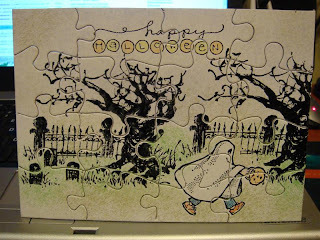 Several people asked me to make a Halloween puzzle for their children. These are what I made this weekend. 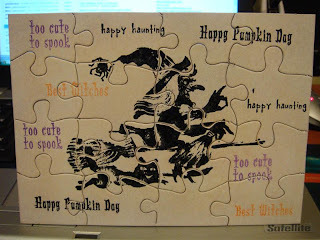 The craft puzzles are all 5" x 7" from http://www.inkadinkado.com/. Witch image (Night of the Witch - 2812K) is from Penny Black (http://www.pennyblackinc.com/) and the word phrases are all from The Angel Company. All images were stamped in pigment ink and clear embossed. This pumpkin image is from Peddler's Pack. I found it yesterday on my stamp store road trip at Kathy John's in Storrs, CT - with my good friend Sue Macken!! 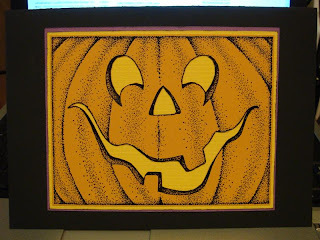 I stippled Pumpkin Stazon ink in the pumpkin image and Dove Gray Stazon around the image. The yellow is just a Marvy Brush Marker clear embossed. Oh, to get the yellow inside the pumpkin I cut the eyes, nose, and mouth out. 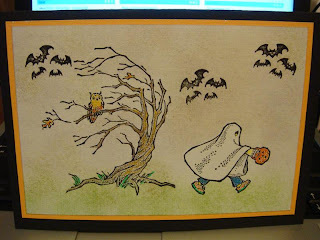 The scary tree and graveyard image (Ghostly Night - 3218K) is from Penny Black (http://www.pennyblackinc.com/) and the kid in the ghost costume is from Too Much Fun Rubber Stamps (http://www.toomuchfunrubberstamps.com/). 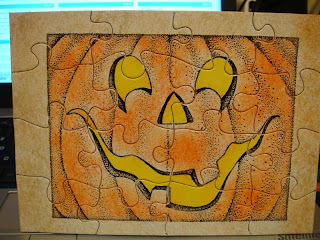 I stamped and embossed the left image first, then stamped the kid, masked him, and stamped the right image over him/her. The background colors are all different inks that I stippled over the images. This is the Peddler's Pack pumpkin again but this time I used an orange and yellow Marvy brush marker on the pumpkin and clear embossed. The edging is stippled Dove Gray Stazon ink.